Sherif Ikrami, Al Ahli goalkeeper, confirmed the team's readiness to meet the Algerian Al-Saoura Youth, which is set for 9:00 pm Friday, at the Stadium of August 20, in the state of Bashar, Algeria, in the second round of the African Champions League group stage. 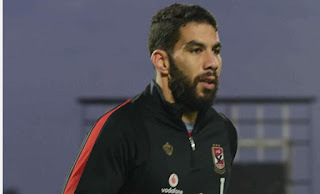 Ikrami added that there is no room for thinking about any difficulties facing the team in the championship, whether in relation to the team's trip from Cairo, or his trip inside Algeria, the pitch of the industrial stadium "Tertan" or even public pressure. The captain pointed out that the hero team is not looking for excuses, but looking to achieve the championships. "We have been used to winning outside and inside our stadium, and that's what we're looking forward to," said Ekrami. "This was the opinion of Lassarti, the coach, talking to us before the match." Al Ahli said that the team was the best beneficiary of the two African Championships in the same season, in order to compensate for last season's losses after losing the title in the final. Al Ahli won their first match against Vita Club 2-0, while Al Saoura lost 3-0 to Tanzania's Simba.